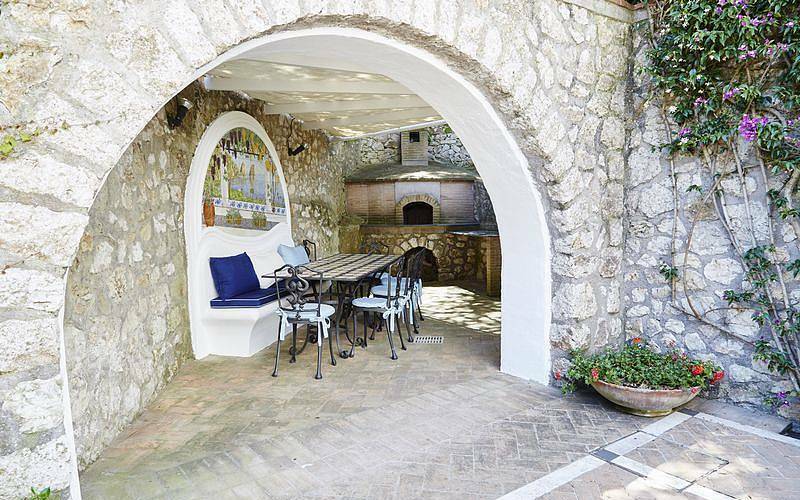 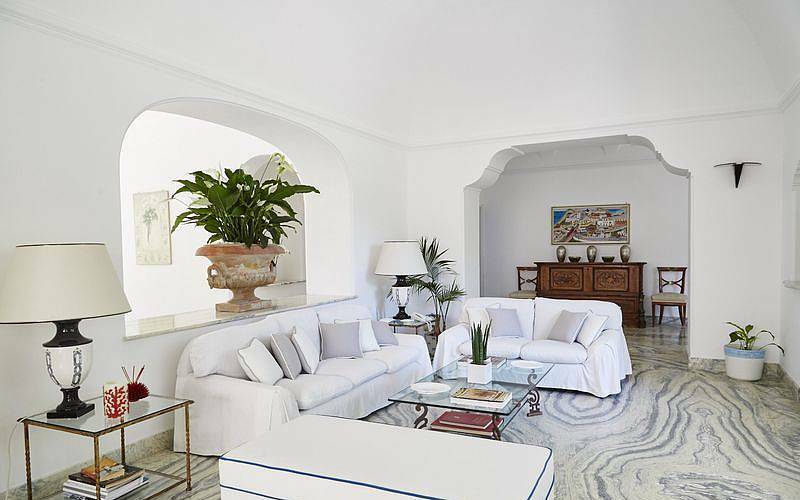 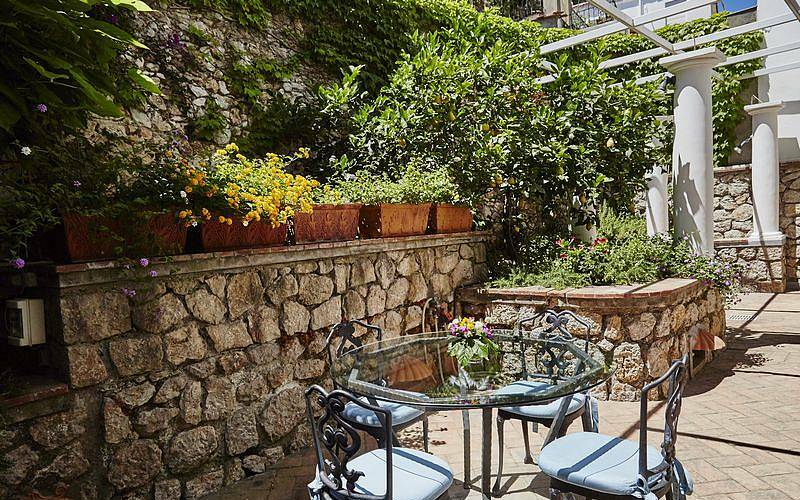 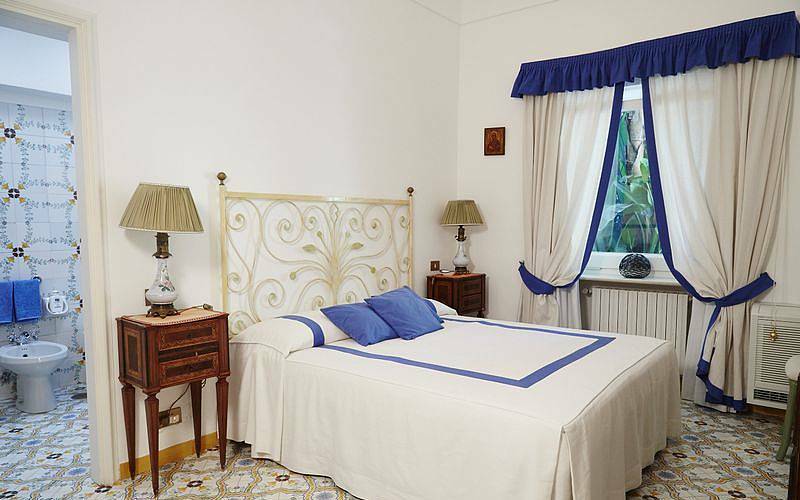 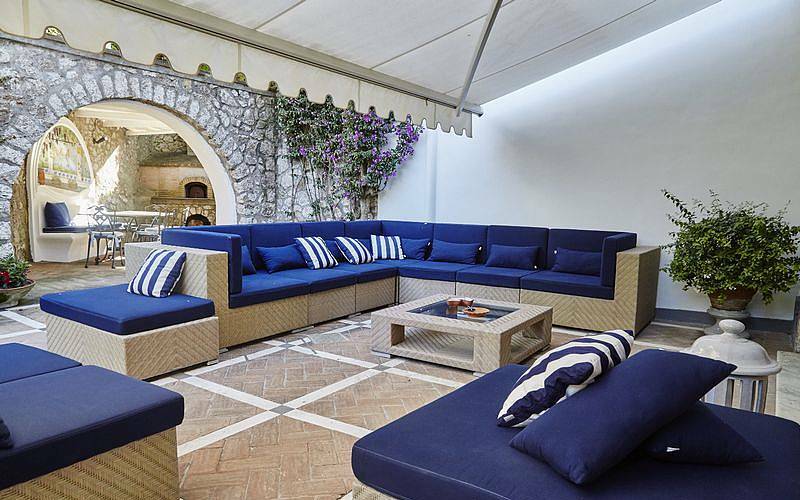 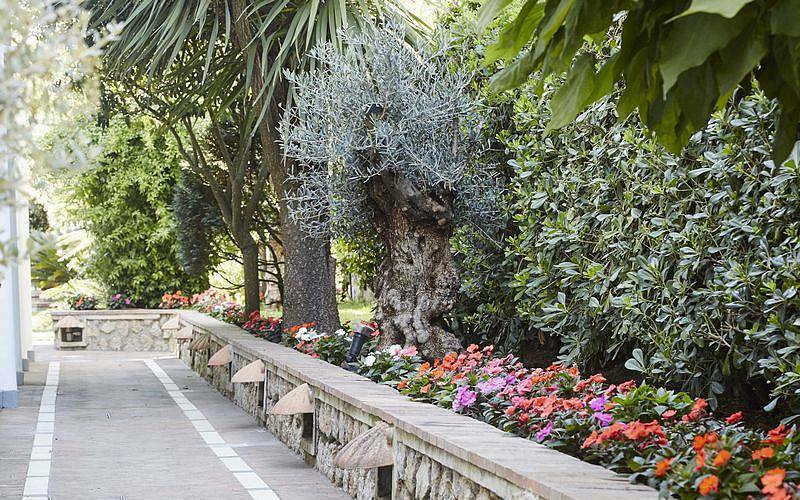 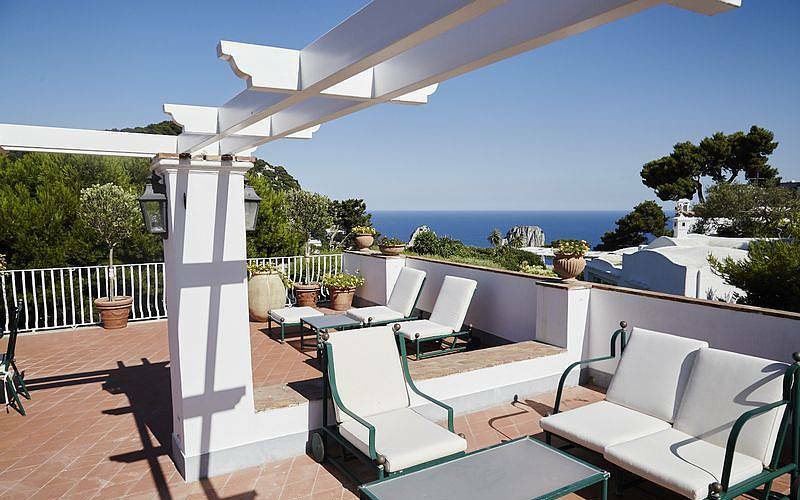 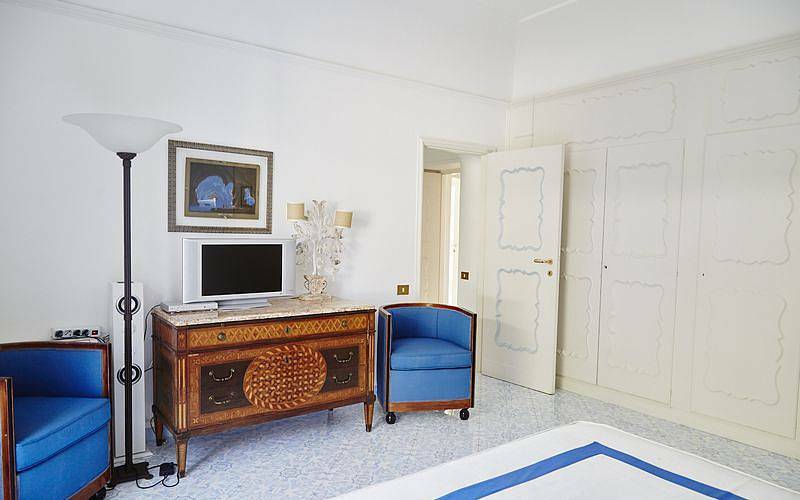 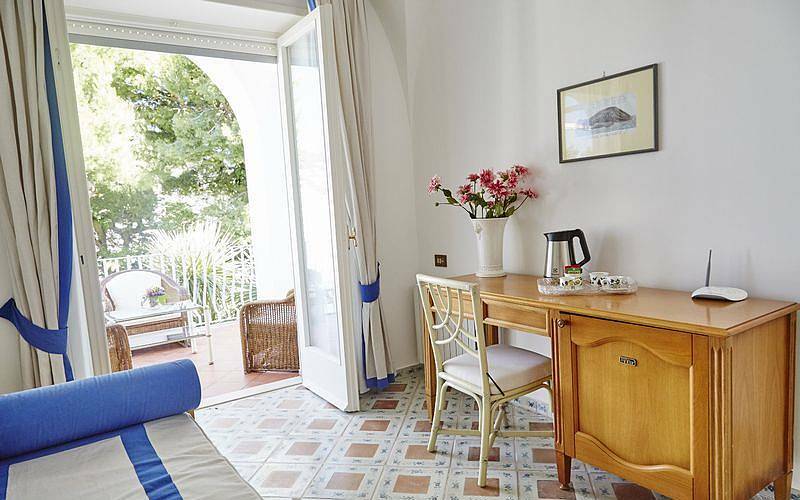 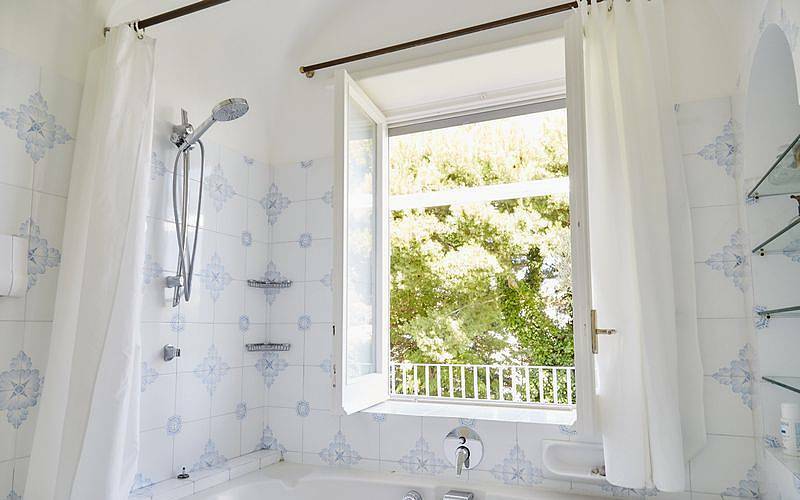 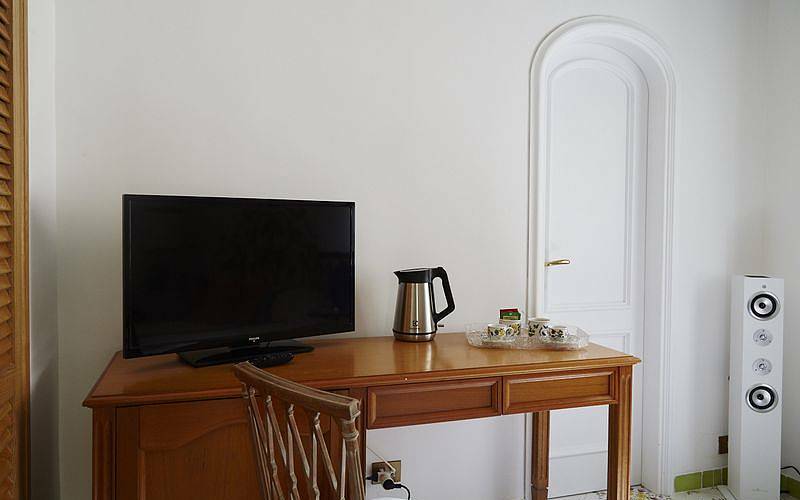 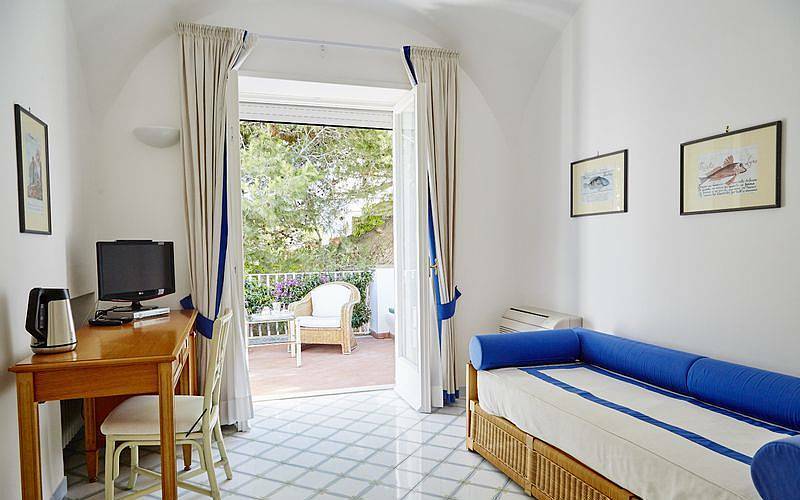 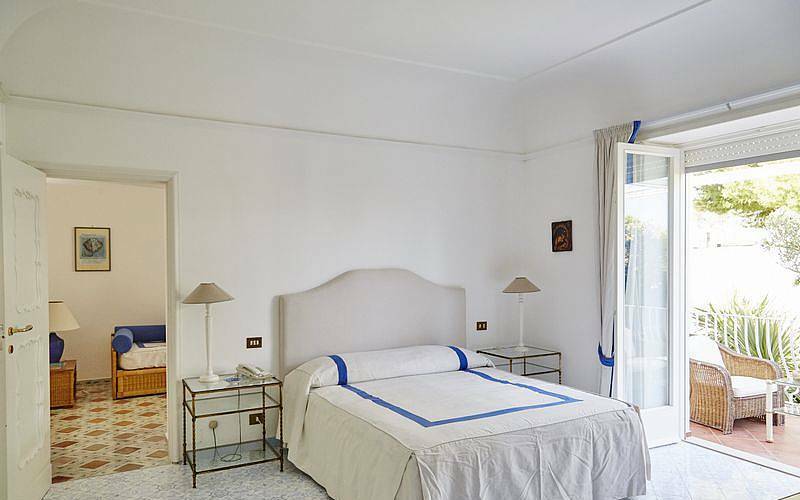 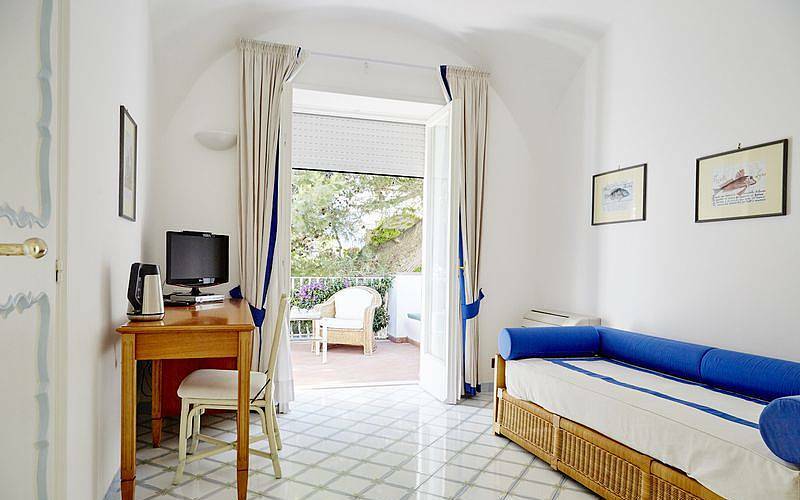 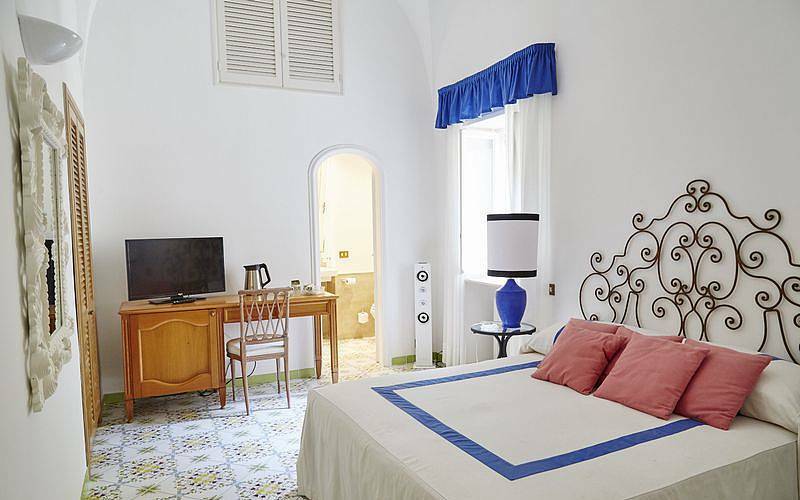 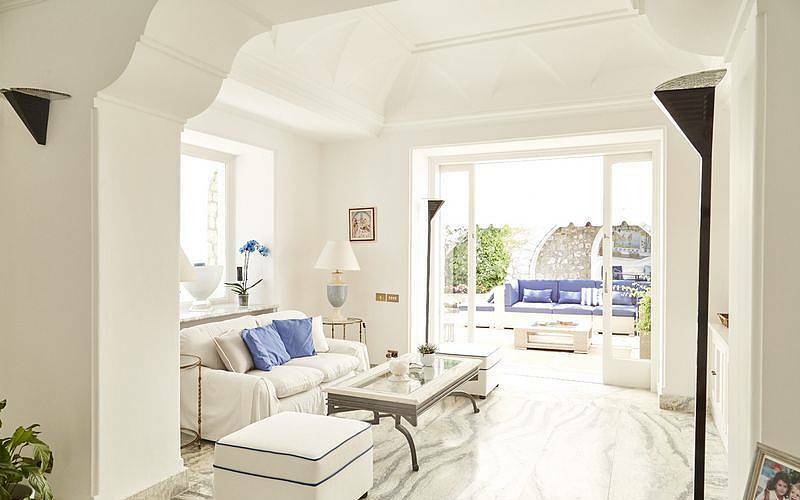 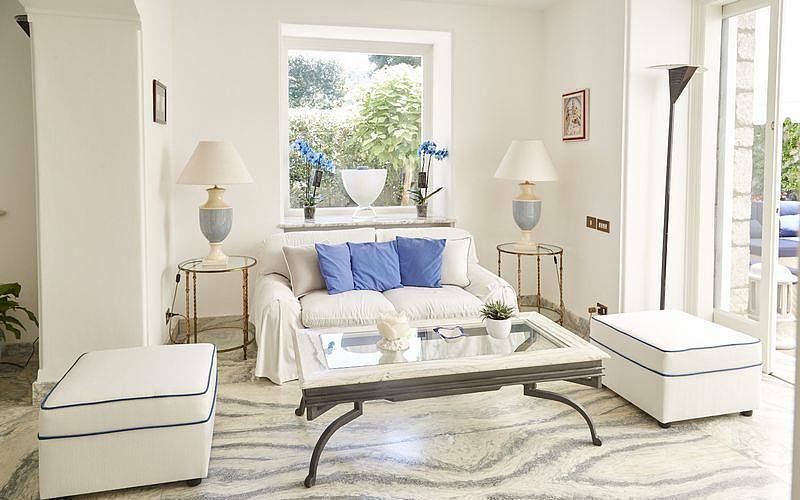 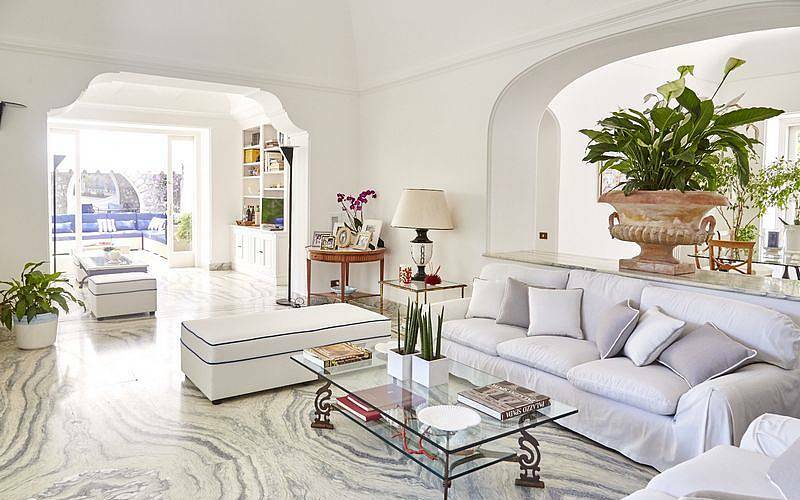 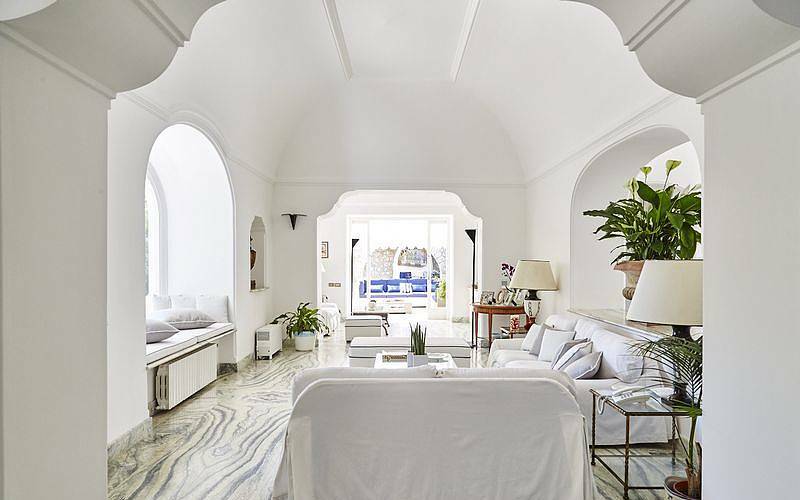 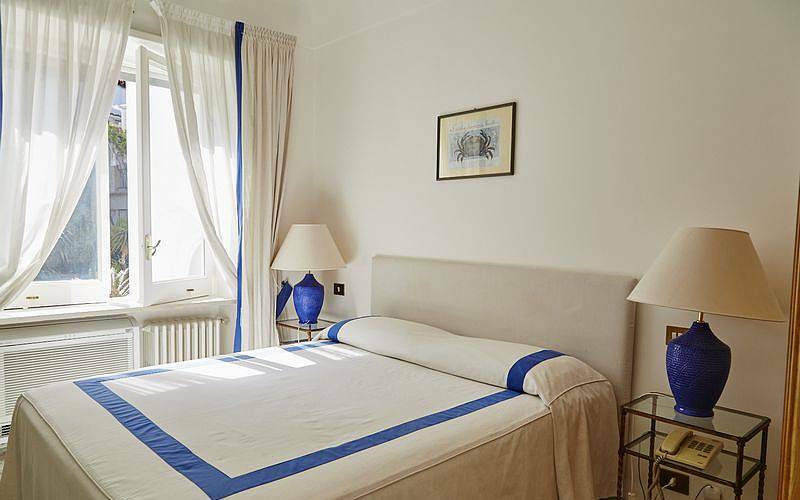 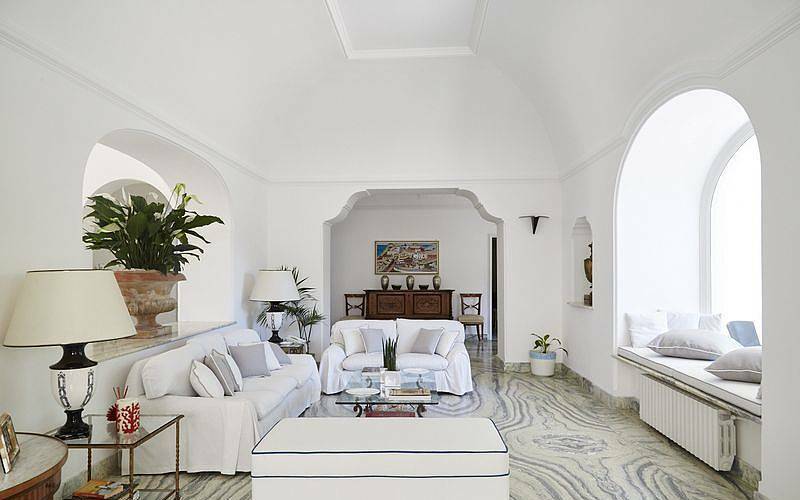 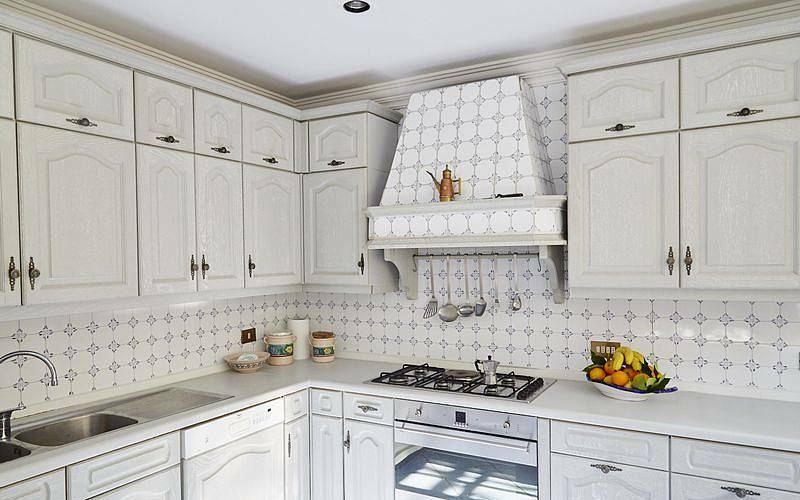 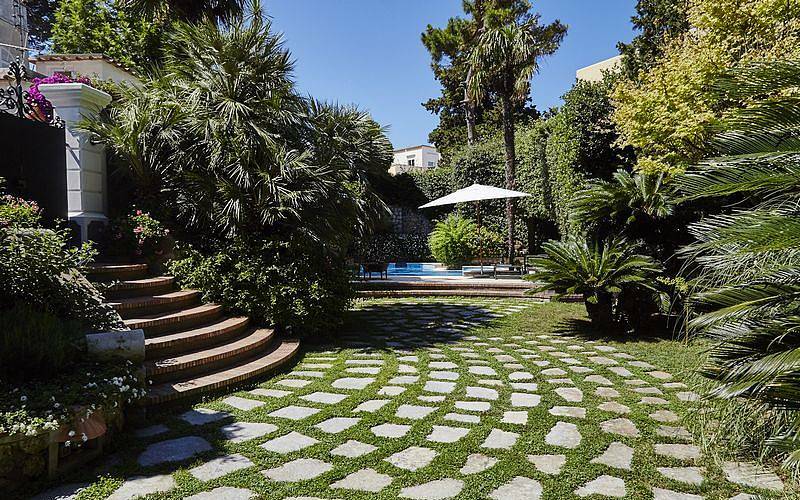 A short walk accompanied by the scents and colors of flower gardens and you are in the vibrant center of Capri, to admire the breathtaking beauty of the landscape and the atmosphere of the "dolce vita caprese": Villa Adele is the perfect location where to live the authentic spirit of Capri Island. 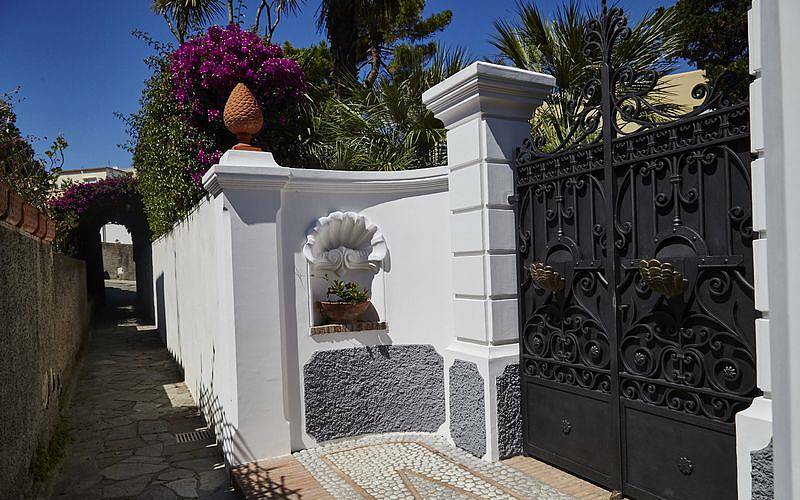 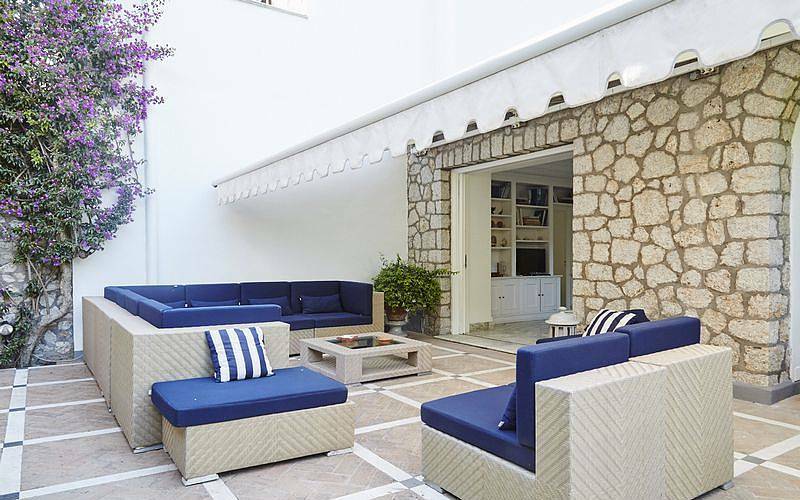 The entrance to the villa opens directly onto the terrace paved with quarzito tiles and surrounded by a beautiful garden with palm trees and juniper trees. 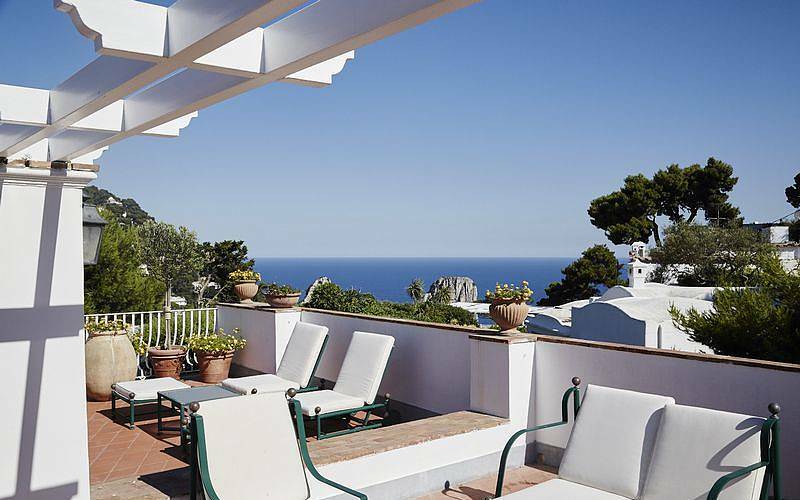 From the terrace you will be taken directly to the pool area, equipped with a system of bio-heating powered by solar panels on the roof. 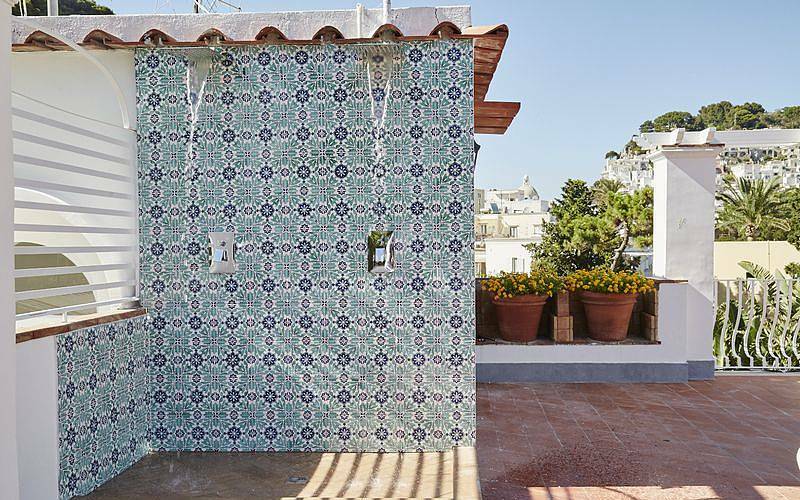 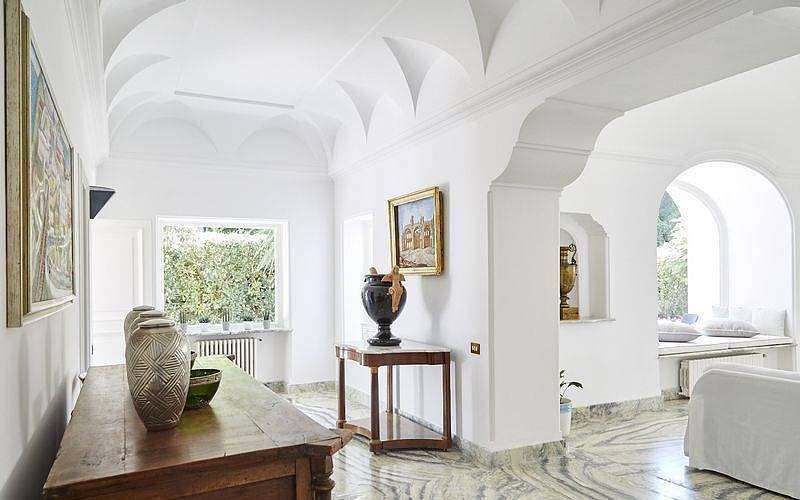 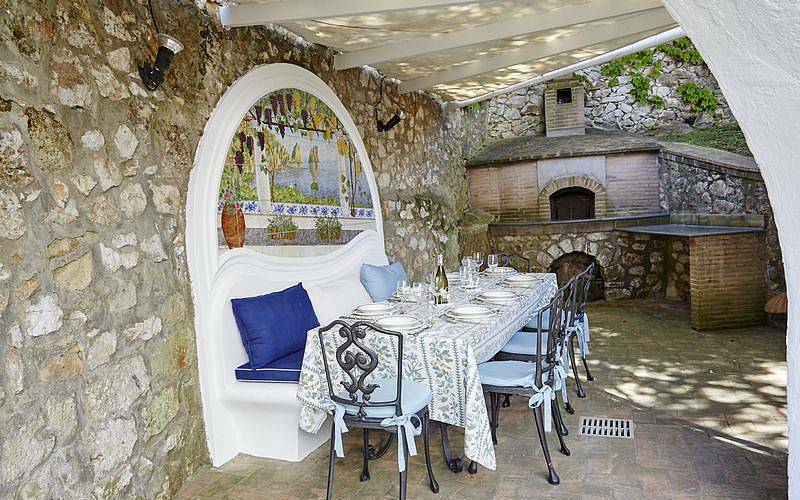 Across the porch, adorned with a large ceramic mosaic, handmade painted you enter the Villa: you will be stunned by the valuable antique furniture of 18th century in typical Neapolitan style. 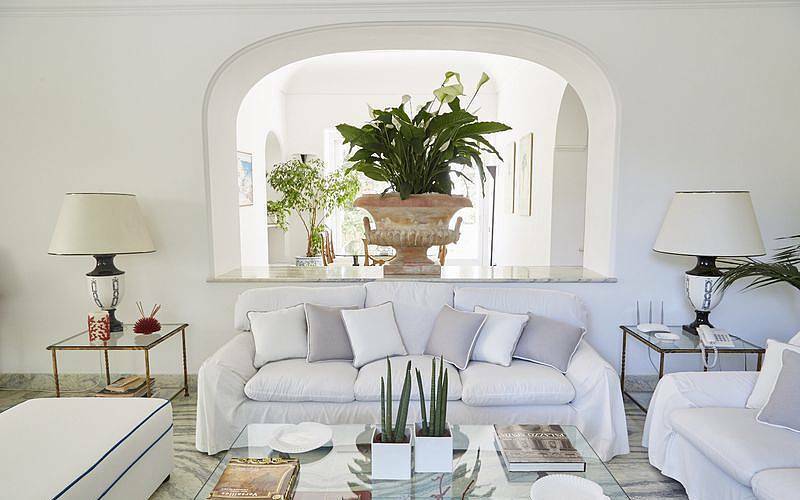 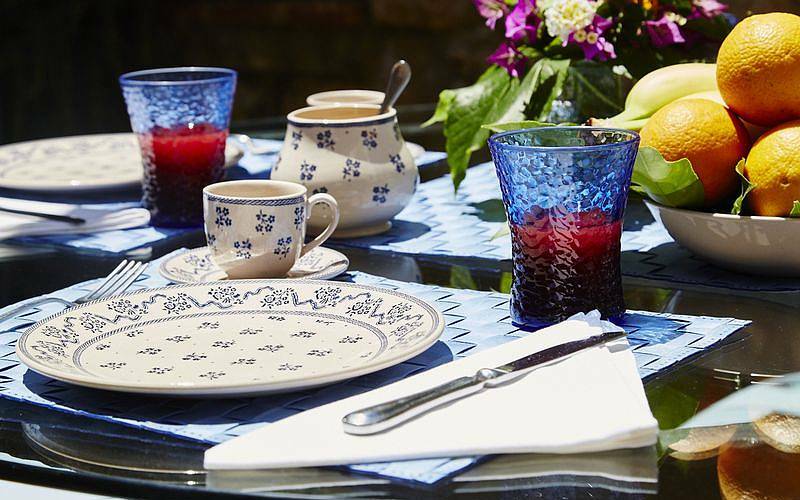 The dining room is provided with white sofas and glass table, illuminated by natural light from the window overlooking the garden, with terrace and wicker furniture. 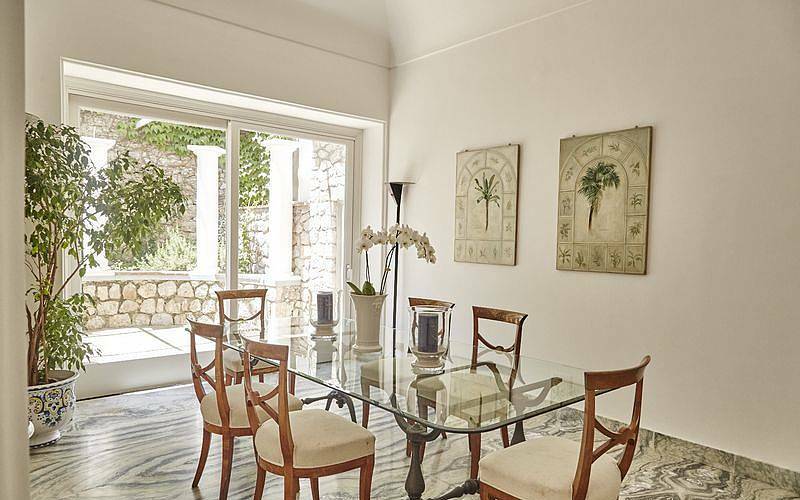 Besides, there is a large dining room fully equipped for leisure moments spent alone or with friends. 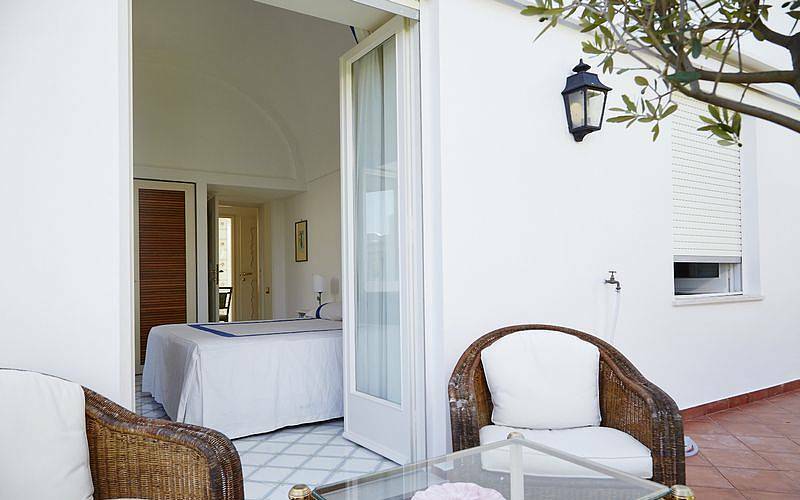 On the same floor there are also two bedrooms, one of them overlooking the garden entrance and the other with private access to the terrace. 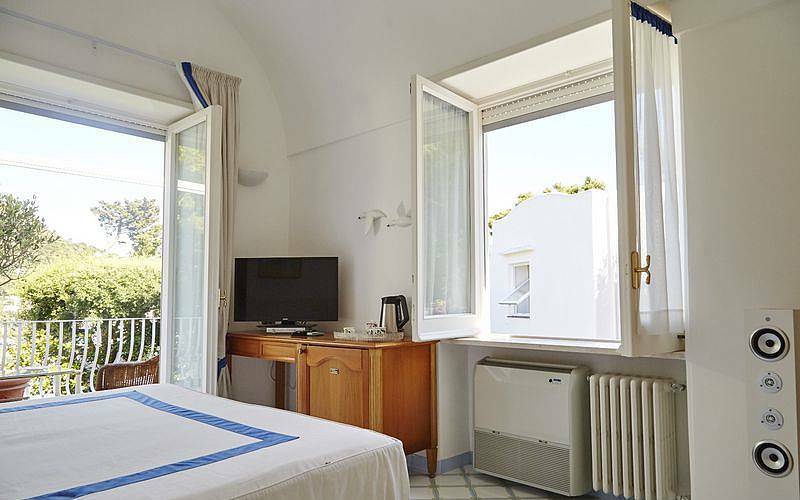 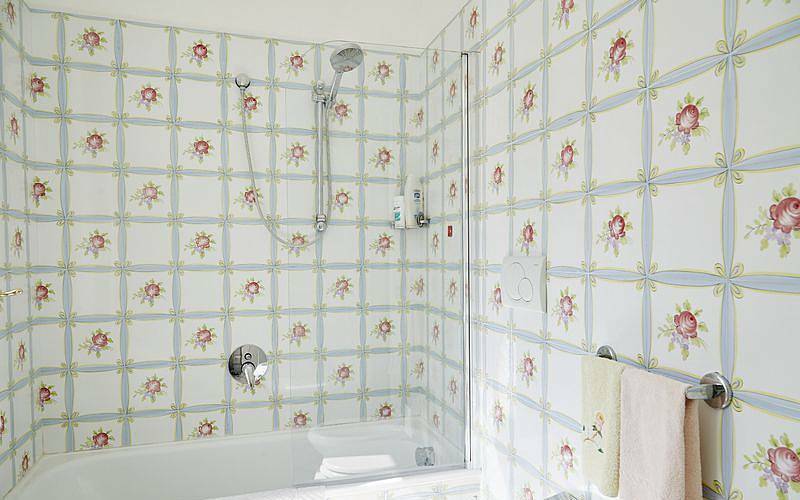 The large and super-equipped kitchen is connected to a basement entirely reserved for the staff with bathroom, laundry, large bedroom with ensuite bathroom. 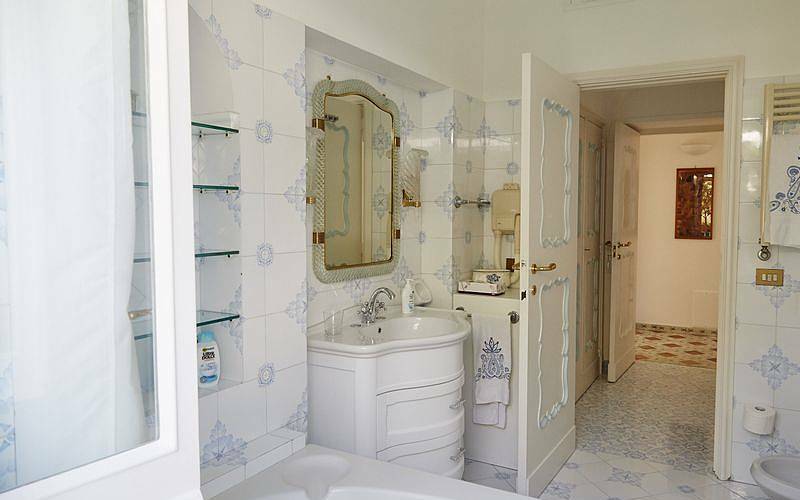 Through the internal staircase that connects the three floors of the structure, you can reach the second floor where there are three more bedrooms and the Master Room, provided with ensuite bathroom with Jacuzzi tub.